* Total number of reviews and star-ratings are based on data collected during the time period Gotelli Plumbing Company has been using the ReviewBuzz system and may not directly match the data found on each public review site. Cory came to investigate a questionable smell under our house and quickly identified the cause - a decomposing rat that our pest control guy wasn’t able to find after 3 visits! Cory was fast, efficient and pleasant! Tom was great as always. He really knows how to resolve complex plumbing and heating systems. 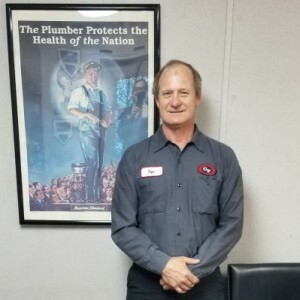 Tom B.
Jeff returned on February 22, 2019 to replace the pump on our hot water heater and cartridge for the Vola faucet in our guest bathroom. He arrived promptly after calling to inform us in advance he was on his way from Tiburon, very professional and efficient replacing the parts within an hour. He provided vital information regarding the pump when the water is shut off. We appreciate his service in taking the time to order the Vola part for us and returning as promised to compete the repairs. Definitely will continue to contact Gotelli Plumbing Company for dependable plumbing services. Tom Robertson is a great plumber - efficient, fast, very likable! Thanks for the great work, Tom! As usual, Tom did a great job! Tom is my go to guy at Gotelli Plumbing. Not only is he knowledgeable in all aspects of the job, he is also courteous, friendly, on time, efficient and fair about the charges. In addirtion, he always takes care not to track dirt into my home and he always cleans up after his work is finished. 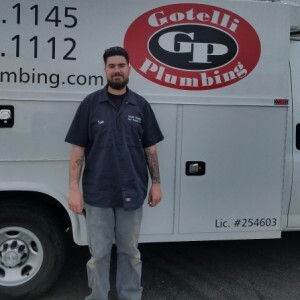 In my opinion, Tom is a terrific asset for Gotelli Plumbing. *** S. was on time and resolved all of my plumbing issues. Will use Gotelli Plumbing again in the future. Very professional company - from those answering the phone to scheduling to the actual plumber. I chose Gotelli Plumbing because I was pleased with them when I last had plumbing needs seven years ago. Jeff was very straightforward in discussing repair vs. replace options. As I had already incurred a service charge for diagnosis, I opted to replace off-brand, leaking toilet. He returned the next day, installed the new toilet, disposed of the old one, left everything clean and satisfactory -- in less than one hour. Additionally, he was very pleasant to deal with. I'm still a bit stunned by costs, but understand that Marin is expensive. I trust I got what I paid for. Overall, I'm a happy camper! On Monday, February 10, 2019, Jeff came out this morning to replace the AquaPur water filter, flush the hot water heater line, checked the pump and guest bathroom sink faucet. He recommended that the pump be replaced, will order the part and the cartridge for the faucet for a return service call. Jeff was very efficient and professional. I called Gotelli Plumbing on Martin Luther King Day for a technician to unclogg a kitchen sink; they sent Cory who arrived at 9am to service the clog. He promptly unclogged the sink by forcing air from the disposal then snaking to further ensure the clog was completely cleared. I have relied upon Gotelli for many of my plumbing needs. They have worked on my water heater, installed a water filter for the entire house and unclogged sewer pipe under the house. They are prompt, professional, courteous and knowledgeable. Excellent workman ship Fast efficent work Great communications Recommend very highly!! Thanks Sam!! Have worked with Tom in the past and he has been everything I've come to expect from Gotelli - on-time, reliable friendly and knowledgeable. Pleasure to work with. Tom was just great--friendly and knowledgeable. Would certainly call again if needed. Tom was great - explained everything and fixed all the items on my list! Great job -- did excellent work that others could not do. Sam was friendly, took the time to answer my questions and got the problem fixed (plus he has a great name). Gotelli is the best, my go-to for years. Thanks Sam! Customer service is always a top priority at Gotelli Plumbing Company. Our BBB Membership A+ rating is like a badge of honor as we continuously strive to provide the best experience for our clients. Tom R has a 5-Star rating and leads the company in total reviews, making this pro a ReviewBuzz Rockstar! Tom, Jared, and Simoni did a big job for us (2 days work, 8am-3pm!) Tom is obviously very knowledgeable and they worked quickly and efficiently. Thanks for your great work! Tom came to my house and fixed all my problems, from a broken Mr. Steam, to replacing sink fixtures, to tightening loose handles. He is very knowledgeable and professional. Tom R., is always on time, courteous and capable. We've used him foe years and is the reason we use Gotelli plumbing company. Tom of Gotelli Plumbing provided superb service for us in replacing a very balky tub spout, and worn out toilet parts. Not only was he extremely professional and thorough but he was able to answer all my questions concerning the service. I would give 6 stars if I could. Tom Richardson is the most efficient, knowledgeable, personable, and fast plumber we've ever had work on our old bathroom faucets and shower. He knows his "stuff"!! Tom has been known to me for many years as a Gotelli service technician. He is always knowledgeable, helpful and on time. Thank you.